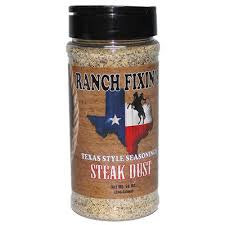 Ranch Fixin's STEAK DUST is a gourmet blend of garlic, black pepper, sea salt, onion, sugar and special spices. Originally blended for use on all cuts of beef, it also works as a terrific seasoning. Try some on skillet or mashed potatoes, on baked or fried chicken, pork, and even as a fajita marinade. Tastes great on steamed veggies and on eggs too!